As threatened, I have once again made some Christmas music. If you enjoy (or hate it, or are indifferent), please consider donating to the UKLGIG. cafdonate.cafonline.org/111#/DonationDetails They support LGBTQI+ people through the asylum and immigration process. Their vision is a world where there is equality, dignity, respect and safety for all people in the expression of their sexual or gender identity. The notes in the 5 movements all come from the same pop song, but in 4 of the movements, they pass through a class I (accidentally) wrote called MidiMangler. It’s undocumented, but the constructor expects the kind of midi events that come from SimpleMIDIFile in wslib and the .p method spits out a pbind. The instruments are some of the sample I used a couple of years ago, but the organ is new. It’s based on one from http://sccode.org/1-5as but modified to be played with a PmonoArtic. The other instruments are the default synthdef *cough*, a Risset bell and Karplus Strong – taken directly from a help file with no changes. These are presented at the bottom for the sake of completion. The other sound is a bomb sample I found on freesound. The other day, I read someone putting for the idea that apocalyptic thinking is so profoundly unhelpful as to be self-indulgent. Climate change is not going out with a bang, but a very prolonged whimper, whilst, for the duration, failing to make any significant changes. We can address it and avoid many of the worst impacts, but we need to get very serious about it immediately. If we can build thousands of expensive, terrifying bombs just in case there might be a war nobody wants, surely, we can afford to spend some of that resource averting a disaster that we know is actually coming. This is the fourth part of a series of posts about how I created my album Christmaswave. Previously, part 1 posted a list of questions and answered the first two of them: ‘What sample am I going to play?’ and ‘How many times am I going to divide it in half?’. Part 2 answered the question, ‘Once it’s chopped into little (or not-so-little) pieces, which one of them am I going to play?’. Part 3 talked endlessly in the meandering way of hangovers about playback rates. One thing I have not addressed is how I picked which parts of source material to use. Unless the words were compelling in some way, I tended to go for phrases that were instrumental. In some songs, this left me only the intro and the outro. This is why most of the pieces have source material taken from multiple versions of the same song. How much should an event overlap whatever comes after? Normally, you would do this by setting the \legato part of the event, which is ‘The ratio of the synth’s duration to the event’s duration.’ I set this to 1.1 in most of the pieces, which helped make up a bit in case the slicing was in slightly the wrong place. This is a question as to what to put for the \dur part of the event, which depends on the number of frames of sample that we're playing, the sample rate of it, and the playback rate. I pulled a lot of my source material from youtube - by using a browser plugin to download and convert to mp4 and the using audacity to convert to wav files. These files were often 48k, which is the standard for film, but audio is generally at 44.1k, so I did have to take the source file's sample rate into account. The glitchy repeating of the same event multiple times is a repetition of the entire event, not just some parts of it. I did this with Pclutch, which has a slightly weird syntax. The pattern is just your Pbind or similar, but the connected part is slightly odd. If it's true, the Pbind is evaluated to produce a new value. It's it's false, the previous event is repeated. It's possible to use a pattern to control this. This is the pattern I used for Walking in a Winter No Man's Land. 0 is equivalent to false and 1 is equivalent to true. 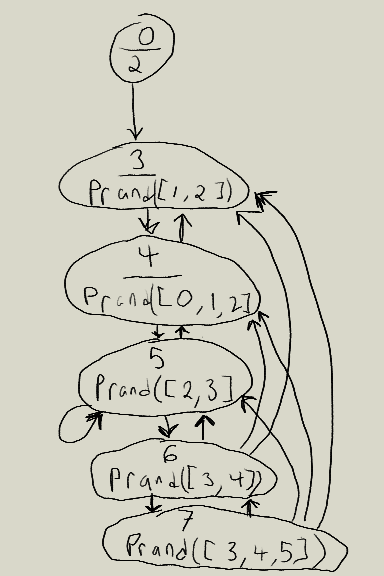 Starting with the Pseq means that the Pclutch will repeat 4 times, then make a new event. After that, it picks randomly from 3 Pseqs. The first repeats twice, the second 3 times and the third 4 times. It will randomly pick between these repetitions for 100 times and then stop. One thing I’ve talked about in both posts is balancing a desire for predictability in running the code and in allowing for random variation. This may seem strange for a studio album, but with my previous Christmas album, 12 Days of Crimbo, I did end up playing one of the pieces, Little Dubstep Boy live at an algorave in Birmingham, so it is possible some of these pieces may have a live afterlife. Perhaps more importantly, allowing for variation allows the discovery of good juxtapositions, which can be made more likely in subsequent revisions of the code. It also makes making the pieces themselves more interesting. Listening to the same thing over and over again in a DAW can get tedious, but subtle changes give something to listen carefully for, keeping one’s ears fresh. I have way more skill in coding pieces than trying to piece them together manually and allowing randomness is an important part of my process. What speed am I going to play the next bit at? Having decided which sample to play, how small to chop it up and which subsection of the sample to play, the next question is what speed to play it back at. This is a question the rate at which I playback the buffer, such that both speed and pitch are effected. A lot of the Vaporwave I’ve listened to seems to play back their samples at slower than the original speed. It also sometimes switches speeds, so that both pitch and timing jump. I like this effect and chose to copy it. I thought of the timing changes in terms of scales. In Just Intonation, scale steps are given as fractions between the ratios 1/1 and 2/1, where 2/1 is one octave higher than 1/1. Because I wanted slower speeds, I adjust downwards, so that the ratios I used were either between 1/2 and 1/1 or between 1/4 and 1/2. These ratios can then be used directly as the rate parameter in a PlayBuf.ar ugen. Obviously, almost all of the source material is in 12TET – that is to say: 12 tone equal temperament, the tuning one finds across the white and black keys of a standardly-tuned piano. Any tuning I apply on top of that is more or less in conflict with the original. 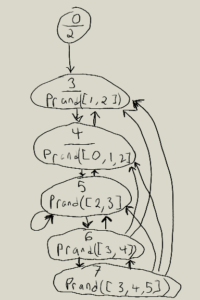 This can be minimised by only using one rate at a time and repeating it across several subsequent bits. By sticking to one rate for a while, a change later on becomes roughly analogous to a key change. It would have been possible to have a set of sensible key changes that work with the standardised harmony conventions of the original song, but this is not what I did. The first piece I worked on, Have Yourself a Scary Christmas is based on Have Yourself a Merry Little Christmas, sung by Judy Garland. That piece and especially that performance of the piece has quite a bit of emotional complexity. The ambiguity of the piece is apparent even in the title, which is not ‘Have a Merry Christmas’, but a more emotionally strangled ‘Have Yourself a Merry Little Christmas’, like someone trying unsuccessfully to be friendly to an ex they’re desperately not over. The music itself is ambiguous about whether it’s in a major key or in it’s relative minor. Garland’s performance adds to this further, soundling slightly drunken and sliding the tuning around in a way that sounds like she’s papering over crushing unhappiness. This effect is especially apparent if you listen to the song slowed down by a factor of 4 with Paulstretch. In order to draw out the sadness a bit, I used a Romainian minor scale. This is part of the included scale library that comes with the SuperCollider Scale object. I then randomly picked ratios from the scale. Support for scales is built into Patterns, but it’s most commonly used to compute frequencies, not playback rates. Almost all the pieces I made used minor scales. I used trial and error to pick which scale worked best with which samples. For all the pieces, I picked degrees randomly and never used anything like a Finite State Machine or a random walk, even those are usually well-suited to picking scale degrees. The Pstutter on the scale degree repeats the degree 8 times before picking a new one with the Pfunc. The rate is calculated from the degree. Because this piece uses voices, I’ve decided to stay closer to a normal playback rate. Using 2/3 instead of 0.5 or smaller means that the samples will sometimes play out faster than their original pitch. Entering code requires the ability to determine pitch and entering data requires both pitch and onset. Ergo, we need a synthdef to listen for both things. There is also two ways to determine pitch, one in the time domain and the other in the frequency domain. The frequency domain, of course, refers to FFT and is probably the best method for instruments like flute. It has a pure tone, where the loudest one is the fundamental. However, brass instruments and the human voice both have formants (loud overtones). In the case of tuba, in low notes, the overtones can be louder than the main pitch. I’ve described time-domain frequency tracking for brass and voice in an old post. The following is completely untested sample code…. It’s my wife’s birthday and I had to go out before I could try it. It does both time and frequency domain tracking, using the fft code to trigger sending the pitch in both cases. For time domain tracking, it could -and possibly should- use the amplitude follower as a gate/trigger in combination with a frequency change of greater than some threshold. The onset cannot be used as the trigger, as the pitch doesn’t stabilise for some time after the note begins. A good player will get it within two periods, which is still rather a long time in such a low instrument. A less good player will take longer to stabilise on a pitch. Everything in the code is default values, aside from the RMS window, so some tweaking is probably required. Presumably, every performer of this language would need to make some changes to reflect their instrument and playing technique. Raspberry Pi Wheezy ships with SuperCollider, but it ships with an old version that does not have support for Qt graphics. This post is only slightly modified from this (formerly) handy guide for building an unstable snapshot of 3.7 without graphic support. There are a few differences, however to add graphic support and maintain wii support. This requires the Raspbian operating system, and should work if you get it via NOOBs. I could not get this to fit on a 4 gig SD card. Note: This whole process takes many hours, but has long stretches where it’s chugging away and you can go work on something else. CC=”gcc” CXX=”g++” cmake -L -DCMAKE_BUILD_TYPE=”Release” -DBUILD_TESTING=OFF -DSSE=OFF -DSSE2=OFF -DSUPERNOVA=OFF -DNOVA_SIMD=ON -DNATIVE=OFF -DSC_ED=OFF -DSC_EL=OFF -DCMAKE_C_FLAGS=”-march=armv6 -mtune=arm1176jzf-s -mfloat-abi=hard -mfpu=vfp” -DCMAKE_CXX_FLAGS=”-march=armv6 -mtune=arm1176jzf-s -mfloat-abi=hard -mfpu=vfp” ..
and add the following lines somewhere before it says end of file. power off the rpi and insert the sd card in your laptop. eject the sd card and put it back in the rpi, make sure usb soundcard is connected and power on again. This post is licensed under the GNU General Public License. This is just how I got it to work and should not be considered a definitive guide. I started Jack via QJackCntrl and then booted the SuperCollider server. I’ve got a drum machine connected via a MIDI cable to an m-audio fast track ultra. One of the great problems in electronic music is picking pitches and tunings. The TuningLib quark helps manage this process. First, there is some Scale stuff already in SuperColider. This will keep up through as many layers of modulations as you want. gravity changes the level of attraction to the in tune frequency. By changing gravity over time, you can have pitched tend towards being in or out of tune.
) This class opens those files. Somewhat embarrassingly, I got confused between 2 and 3 dimensions when I wrote this code. A forthcoming version will have different method names, but the old ones will still be kept around so as not to break your code. This is not the only quark that does dissonance curves in SuperCollider. Dissonance curves are used to compute tunings based on timbre, which is to say the spectrum. The combination of pitches produces a more complex graph with minima. Those minima are good scale steps. This class is currently optimised for FM, but subsequent versions will calculate spectra for Ring Modulation, AM Modulation, Phase Modulation and combinations of all of those things. // will be mapped accordingly. The only problem here is that this conflicts entirely with Just Intonation! For just tunings based on spectra, we would calculate dissonance based on the ratios of the partials of the sound. Low numbers are more in tune, high numbers are less in tune. How do we pick tuning degrees? We use a moving window where we pick the most consonant tuning within that window. This defaults to 100 cents, assuming you want something with roughly normal step sizes.